In an age were Japanese manga reign supreme, another form of comics is also gaining momentum in around the world - Hong Kong kung fu comics. On June 29th, the winner of the first Internation Manga Award was announced to be the 43-year-old Hong Kong artist Lee Chi Ching. Another Hong Kong artist, Kai, was one of the three runner-ups. In 2008, an animated movie based on the popular Hong Kong comic Storm Riders by Ma Wing Shing will be released. The movie, Storm Rider - Clash of the Evils, is said to be the first animated movie created in the style of Hong Kong kung fu comics. While the Hong Kong comics market seems to be doing better than ever, the truth is that the market has been declining for the past 10 years or so, and many people are questioning the direction the Hong Kong comics market is heading. 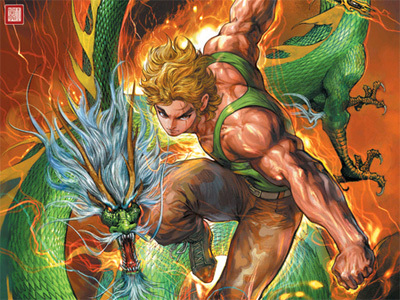 Hong Kong kung fu comics, also known as kung fu manhua, offers a wide range of genres involving kung fu, from fantasy or historical series like Legend of Tang Dynasty's Double Dragon and Saint, to modern action series like New Oriental Heroes. When they were first introduced, these comics from Hong Kong brought into the scene an all-new style and storytelling techniques, breathing fresh air into the Japan-dominated market. Chinese fans were particularly fund of these kung fu comics, bacause they are based on something from their own culture. One can't mention Hong Kong comics without mentioning two names, Wong Yuk Long (also known as Huang Yulang or Tony Wong) and Ma Wing Shing. Wong Yuk Long is regarded as the godfather of Hong Kong comics, just as Osamu Tezuka is to Japanese manga. Born in 1950, Wong Yuk Long began drawing at the age of 13. Despite early failures, the young artist made a smash hit with his 1969 work Little Rascals, the first issue of which sold over 7,000 copies. At the age of 18, Wong Yuk Long successfully revitalized the waning Hong Kong comics market. Later on, the title of Little Rascals was deemed uncultured, and was changed to Oriental Heroes (Dragon Tiger Gate). The series continues to be published today (under different artists). As of 1987, Wong Yuk Long's works dominated 80% of Hong Kong's comics market. Ma Wing Shing, who happens to be Wong Yuk Long's student, was another comics master who defined the kung fu genre. One of his most popular works, Chinese Hero, was considered to be on the same level as the legendary Oriental Heroes. At its peak, the series sold over 200,000 copies. Wong and Ma went on to found Jade Dynasty and Jonesky (Tianxia), two of the largest comic production companies in Hong Kong. With the two artists leading a large number of talented artists, the booming economy and the popularity of Bruce Lee, Hong Kong comics saw its golden age in the 1980s. Hong Kong kung fu comics helped define Hong Kong, and in turn, a part of China's comics culture. One of the popular plot devices at the time was about Chinese heroes fighting against bad guys from Japan. While many believed China has finally found its own place in world of comics, many argued that Hong Kong comics were heavily influenced by Japanese manga. For a comprehensive analysis of this argument, check out the article "Japanese Elements in Hong Kong Comics: History, Art and Industry." However, while fans in China rejoiced over their new kung fu comics, some began to have doubts, "is this really the time to celebrate?" As time went on, it became apparent that it's almost impossible to see anything other than kung fu comics coming out of Hong Kong. Some anime and manga publications began to ask: "Does Hong Kong comics have anything other than kung fu?" Although other genres do exist, they're either too obscure or too old to make an impact. Also, the art and character design in kung fu comics are becoming increasingly similar. All protagonists are strong, handsome and extremely lucky, and have a tendency to turn extremely bad situations in their favor, while the villains are all the embodiment of pure evil. This is the reason Hong Kong manhua today pales in comparison to Japanese manga. Japanese manga covers a wide variety of genres and topics, with their readers ranging from children to grand parents. Not only is manga full of different and interesting characters, but the style varies from artist to artist. Japanese culture seeps through each volume of Japanese manga. In the mid-1990s Hong Kong comics began to decline. As a result, a new generation of artists who grew up reading Japanese manga began to experiment with new genres and techniques. Fans, as well as professionals from the industry, are questioning why is it that Hong Kong comics only have kung fu, while Japanese manga grew to be so diverse? While there are many devote kung fu comics fans, if Hong Kong wants its manhua market to grow, Hong Kong artists need to start exploring new areas of interest. Submitted by Zer0 (not verified) on Wed, 2007-07-11 18:50. I chanced upon your entry on Hong Kong comic. I believe that there's more to HK comics than the kung fu stuff. Submitted by KC (not verified) on Thu, 2007-10-04 14:01. I still remember the golden age of Hong Kong comics in the 1980s. It was an exciting time. The ads in one comic would make you want to buy another. The endings in the each issue were a cliffhanger! I think the decline started in the early-90's : the art in the comics got worse and I no longer became interested in seeing the latest issues. There was been a rebound or two, but nothing like it was in the 80's. Submitted by jorge ho (not verified) on Sat, 2009-01-17 21:31.
hello,hopes that u can help me!, i was living in hong kong in the 80`s also.i am been searching for this comics for a long time,i cant even found a single pics image of(lung fu moon)comics,now im in miami...can u please give me a web site,that i can find wallpaper or any tipe of pics from lung fu moon.i like to have for my desktop wallpaper,or where to buy the comics book of it!. Submitted by Sweetie (not verified) on Sat, 2007-11-03 12:17. Submitted by Anonymous (not verified) on Wed, 2008-04-16 16:15. Although other genres do exist, they're either too obscure or too old to make an impact. Tongzhi comics are a huge underground from my understanding. Maybe this is all that gets imported and so receives the most attention from potential publishers. Also, Brits used to publish like hell--one even received international recognition for it, though the comic is pale. Wasn't there a big 'magical wuxia with clear manga stylings' kick a few years back that pushed the kung fu genre to the side for a few years? I recall two or three things from that. Is it too much to point out that there seems to be a trend of dismissive or negative review of Chinese comics? (Korean comics hardly receive mention at all.) Does this suggest a bias on the part of this site or an unfamiliarity in the U.S. and a tendency to judge? Only curious; possibly pointing something out to the site in general in case it was unaware. Also--manga comes from talent pools beyond Tokyo and Yamanashi prefecture. It seems hard for a lot of people to grasp for some reason, since Tokyo is cyberorientalist capital of the world. Also, Japan tends to pour a similar amount of investment into its serialization of samurai manga. Since it's a larger talent pool by far larger in population and size than Hong Kong, perhaps the redundancy is a lack of analysis. For instance, it might be a good idea to compare the markets in the terms of titles and their genres. That might balance out to kungfu margin and indicate that there is much more going on. Also, an article highlighting interesting Chinese titles that aren't kungfu or problematic shoujo might help that market expand. Submitted by dyuken (not verified) on Sun, 2009-02-22 16:39.
and that there is anything wrong with Kung Fu Comics. really cool and intersting stuff as of late in both HK comics and Korean comics. I actually believe that the manga market has become like Hollywood, quite creatively bankrupt. This applies to anime as well. So maybe the manga market should do some diversification. Submitted by Anonymous (not verified) on Mon, 2009-04-20 07:29.
respect for hong kong comic..actually tony wong.. Submitted by Anonymous (not verified) on Mon, 2009-04-20 07:30.
respect for hong kong comic..